Preheat the oven to 350°F. Rub the bottom and sides of an ovenproof 8-inch skillet with some of the melted butter. Begin to layer potato slices in a circular fan around the bottom of the skillet, overlapping by a third, until the whole surface is covered. Add a second layer of apples and parsnips covering the surface in overlapping slices, alternating between the two. Brush the layers with butter and sprinkle lightly with salt, pepper, and nutmeg. Repeat this with layers of potato, then apples and parsnips, brushing with butter and seasoning with salt, pepper, and nutmeg after each layer of apples and parsnips, until the skillet is full. Brush the final layer with butter and transfer the skillet to the oven. Bake for one hour until the edges brown. Remove from the oven and let cool slightly. 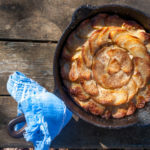 Serve in wedges directly from the skillet, or if you’re feeling fancy, set a plate smaller than the circumference of the skillet onto the tart and invert the tart onto the plate.